The OTvest, Weighted Vest Applies Calming, Behavior Organizing, Deep Pressure Therapy for Those with Autism. When we feel better, we do better -- and that is exactly what happens in those wearing the OTvest™! Many persons with autism have a sensory processing disorder, which causes them to have difficulty functioning because of either over-responsiveness or under-responsiveness to sounds, smells, touch, movement, or visual stimulation. They may also have problems with coordination due to the inability to respond to information from their hands, eyes, and other parts of the body. These body cues provide proprioceptive feedback to the brain about body position, and a reduction of this proprioceptive feedback can cause stress and anxiety from the lack of feeling “grounded”. To combat this, the use of deep pressure touch therapy can help autistic individuals feel a sense of calm, focus, and can help teach self-regulation. Deep pressure touch therapy can also introduce proprioceptive information to the brain, helping with body awareness and coordination. And the OTvest™ weighted vest is the perfect way to provide deep pressure touch therapy without the help of another person. This allows the OTvest™ to act as a perfect autism remedy, to promote a sense of calm, focus, and well-being for those with autism. Autistic individuals can often have difficulty calming themselves when presented with an overwhelming stimulus. In this case, the OTvest™ provides a holistic treatment option, or alternative to medication, to help address these behavior issues. The OTvest™ is a perfect autism remedy that works by applying deep pressure touch therapy to the shoulders and upper back of the wearer. This deep pressure often reduces self-stimulatory behavior (repetitive movements, hand flapping, pacing, etc. ), so that the wearer can engage in more purposeful activities. If you’re looking for how to help children with autism, look no further than the OTvest™. When wearing the weighted vest, those with autism feel better, and do better! Think of someone pressing gently but firmly down on your upper back and shoulders. Not only does it feel good, but it has a naturally calming effect. When we see other people that are anxious or over-stimulated, we instinctively do this movement, maybe even reminding them to “calm down,” as we do so. The OTvest™ is a weighted vest that simulates this feeling through deep pressure touch therapy, and can be administered throughout the day, inexpensively, discreetly, and without the help of another person. "My son has Autism and started using the OTvest in JK (pre-kindergarten). We first purchased the vest on a recommendation through the occupational therapist that he was working with at the time. We purchased the OTvest for him and noticed a difference in his behaviour when he wore it. His teacher said that it really helped him settle and get back to doing his work especially after lunch and recess. He is in grade 4 now and we just purchased our second OTvest. We even take it with us to appointments where I know he will have a difficult time sitting still. We love it. Thank you OTvest for helping make our day better!" For autistic individuals with speech, oral motor or feeding problems, the use of the OTvest™ can help address these conditions by applying deep pressure, making mealtimes more pleasant. Compression vests or weighted blankets often aim, and fail, to do what the OTvest™ effectively does: stabilize the trunk of the body. The OTvest™ stabilizes the trunk of the body by deep pressure therapy on the scapula, upper back and chest. The trunk is fundamental to stabilizing the neck, head, and the oral muscles needed to address oral motor dysfunction. When the trunk is stable, autistic individuals have a much easier time with all oral motor movements. The OTvest™ is a holistic treatment addition to improve function and attention needed for daily activities—including in the classroom or workplace. The OTvest™ is a perfect classroom intervention for autism-related behaviors, as the deep pressure invoked on the wearer is designed to calm and refocus attention to more purposeful activities, such as completing assignments, cutting paper, or drawing within the lines--classroom activities that may have been challenging for those with autism previously. The OTvest™ is a weighted vest that can be worn when the family eats out, during homework, church, car and plane travel, or even to help calm during the sensory overload of haircuts and trips to the dentist! Adults can wear the OTvest™ while in social, work, or academic settings as well. It is Important Where the Weight is Placed! We often hear runners say that running gives them a "natural high" because of the increase in the brain’s chemical neurotransmitter dopamine after cardiovascular activity. Similarly, deep pressure touch therapy stimulates changes in the brain’s chemistry, and can create a calming, focusing effect. Deep pressure touch therapy can be achieved through a weighted vest, such as the OTvest™, conveniently allowing the wearer to calm themselves, without the help of another person. These weights, which are distributed across the upper back and chest in the OTvest™, is thought to stimulate the brain to produce the calming "brain chemicals" norepinephrine, epinephrine, and serotonin. 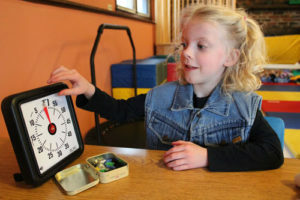 Nancy VandenBerg, an occupational therapist since 1975 and creator of the OTvest™, observed that 1 out of 10 children in a school where she provided OT services were going to the office for “attention medication”. She did a research study within the school system to determine if there was an alternative method to improve the attention of the students. The results were published in the American Journal of Occupational Therapy (VandenBerg, 2001). 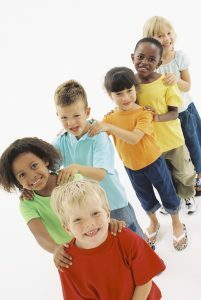 The children in the study were diagnosed as having attention difficulties in school, and required a classroom intervention for ADHD, a classroom intervention for autism, and other distracting behaviors. They were timed both while wearing a weighted vest, not wearing a weighted vest, and while engaging in the same activity to measure their attention-to-task. The children in the study showed an 18-25% increase in their attention when wearing a weighted vest (weight of 5% of the wearer’s body weight) compared to not wearing one. The study showed a 95% statistical probability that the increase was due to the weighted vest. These exciting results prompted Ms. VandenBerg to design a “better” weighted vest—the OTvest™—where the weight was positioned to lie directly upon the body of those wearing it. Other weighted vests, weighted blankets, and compression vests available simply line the pockets with pellets or sand. These weights are pulled down by gravity, and aren’t as effective at producing deep pressure touch therapy as the OTvest™ is. The OTvest™ utilizes dense steel plates that are designed to lie directly on the muscle receptors of the wearer. This way, the OTvest™ applies calming deep pressure touch therapy directly to the body of the wearer, where it can have the most effective impact on the sensory receptors in the body. The placement of the dense steel plates within the OTvest™ is key--it presses down on the wearer, rather than pulling down on the wearer. This revolutionary weight positioning in the weighted OTvest™ means that less weight is required, compared to other weighted vests, to achieve the same beneficial results. This sustained deep pressure, like the swaddling of a newborn, can create a sense of well-being, increasing focus, attention-to-task, and function (fine motor skills), promoting better sleep, and decreasing anxiety, stress, and agitation. Improvement in balance, motor coordination, and awareness of where one is in space (sense of body position, or kinesthetic awareness) often shows improvement with the proprioceptive input from the deep pressure the OTvest™ provides. This also helps to decrease the accompanying anxiety that the lack of feeling "grounded" produces. Weighted blankets, neoprene pressure vests, or compression vests, do not have this trunk stabilizing effect. They absorb perspiration, usually require a garment to cover them to look non-therapeutic, and typically require assistance to take them on and off. The OTvest™, on the other hand, has snaps to independently put on and off, and can be worn over a t-shirt, hoodie or any garment of the wearer’s choice. Although the OTvest™ does not readily absorb perspiration, the weight insert can easily be wiped down, and the vest laundered, making it the perfect weighted vest for multiple wearers. Perhaps one of the most important benefits of using the OTvest™ is the increase in self-esteem felt by the wearer. “It feels good!” is a common exclamation from first-time OTvest™ wearers. They know that the OTvest™ can allow them to feel good, and therefore, do better! Deep pressure touch therapy may stimulate the increase in serotonin, as well as other soothing neurotransmitters, to create a natural calming effect on the central nervous system in those with autism (VandenBerg, 2001). This is why it is important that the weights in weighted vests lie directly on the body to stimulate the increase in neurotransmitters, as is the case with the OTvest™. The benefit of the OTvest™ is that this weighted vest can provide deep, sustained pressure for extended periods of time. Current school-based occupational therapy practice in the United States often incorporates the use of weighted vests to increase children’s attention to school-based tasks. This means that the OTvest™ is a perfect classroom intervention for ADHD, classroom intervention for autism, and a perfect classroom intervention for those with related conditions, who need help with increasing focus and attention in the classroom. Psychiatric facilities, autism centers, specialized treatment programs, and parents across the country and internationally have been ordering the OTvest™ since 2002 for the purpose of calming, modulating the arousal level, and increasing attention to purposeful activity for those with autism. An important resource for information regarding autism–including awareness, information, research and fundraising. McClure, M. K., & Holtz-Yotz, M. (1991). Case Report—The effects of sensory stimulatory treatment on an autistic child. American Journal of Occupational Therapy, 45, 1138–1142. Miller, A., Moncayo, Z., Treadwell, D., & Olson, L. (1999, April). Children with autism using weighted vests: Two single-subject studies. Paper presented at the American Occupational Therapy Association Annual Conference and Exposition, Indianapolis, Indiana. Temple Grandin, Ph.D (1992), Calming effects of deep touch pressure in patients with autistic disorder, college students, and animals, Journal of Child and Adolescent Psychopharmacology. Vol. 2,1.